Happy Sunday! How was your weekend!? We had a very easy-going one! Those are so nice every once and a while! We (finally) had time to take down Christmas decorations, spend time with family, and we took a ton of blog pics (thanks to my amazing fiancé! He is going to make the best blogger hubby ever, lol). It snowed a little bit Friday night, but melted quickly when the sun came back out on Saturday morning. However, the temps were literally in the 20's all weekend long! Talk about chiiiilllyyyy. 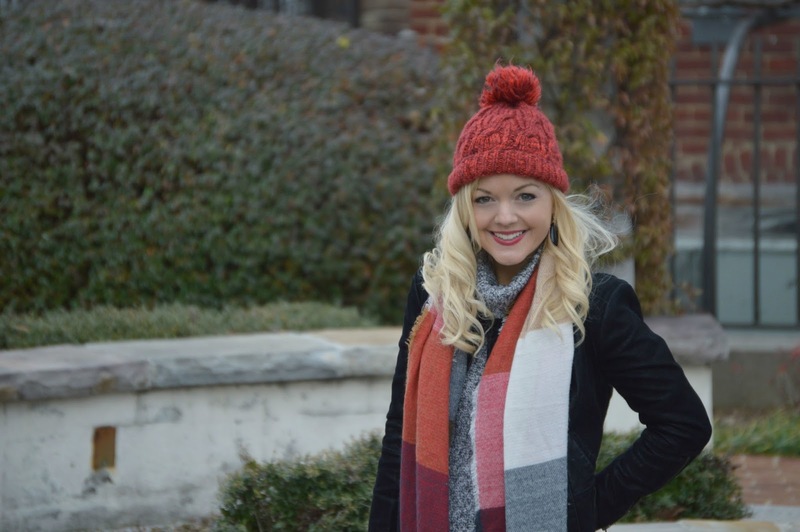 The look I'm wearing above features some of my favorite "winter staples." First of all, a chunky cable knit turtleneck is a must-have for your winter wardrobe. They are essential in my book for super cold days (enter: this weekend's 20 degree temps!). I bought this one at Old Navy (which my exact one is not currently online, but I linked a similar one above that I love!). 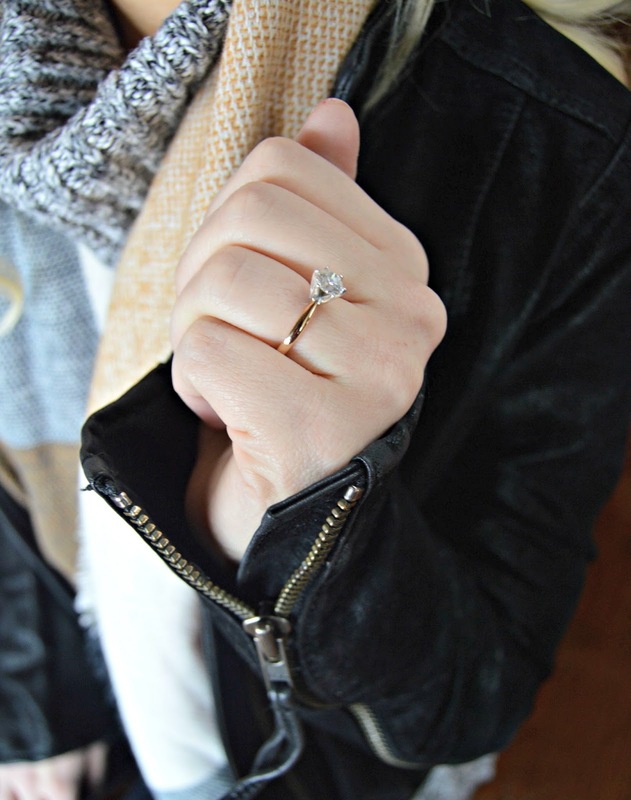 Next on the list, a nice, not-so-basic jacket with pretty details! The one I'm wearing above is by Free People and I am obsessed! It has zippers on the sleeves which not only adds some interest to the look, but it also is practical because...hello, has anyone else had the problem of a jacket fitting snug over a thick sweater?! Un-zip the sleeves a little bit, and it's way more comfortable because it gives your thick sweater sleeves a little room to breathe! Scarves, scarves, and more scarves. 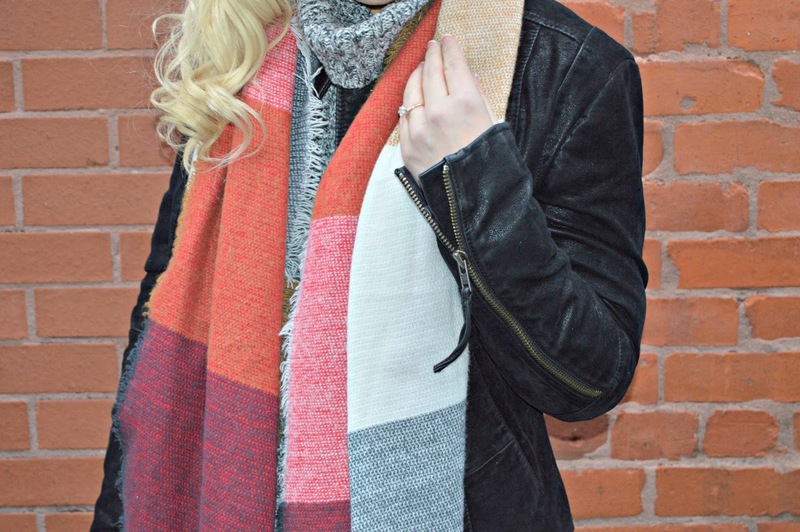 Yes I know I blog about scarves A LOT, but it is because they are seriously an essential to my every day look during the winter months. They are the perfect way to stay warm, but added bonus: it can make a sweater you have worn a million times look like a brand new outfit. I firmly believe in the power of accessories!!! They are total game-changers & outfit remixers, ladies (& gents)! A pair of warm boots are a winter must-have. Yes Uggs have definitely had their "moment" but no matter where you look, stores still sell them & there's a VERY good reason. They are seriously the warmest things you will ever put on your feet! I have around 8 pairs of different kind of Ugg boots, but I have to admit...these sequin ones are some of my faves! They are on sale where I linked them under my picture, so check them out! These definitely run true-to-size and are perfect for the cold temps. Your feet will thank you! Last, but definitely not least on my list, is a winter hat. The pom pom beanie is one of my favorites. They provide warmth, and, BONUS: they cover up a bad hair day too, haha! There are soooo many cute ones in stores now & they are relatively inexpensive, so it's an easy way to once again remix an outfit. 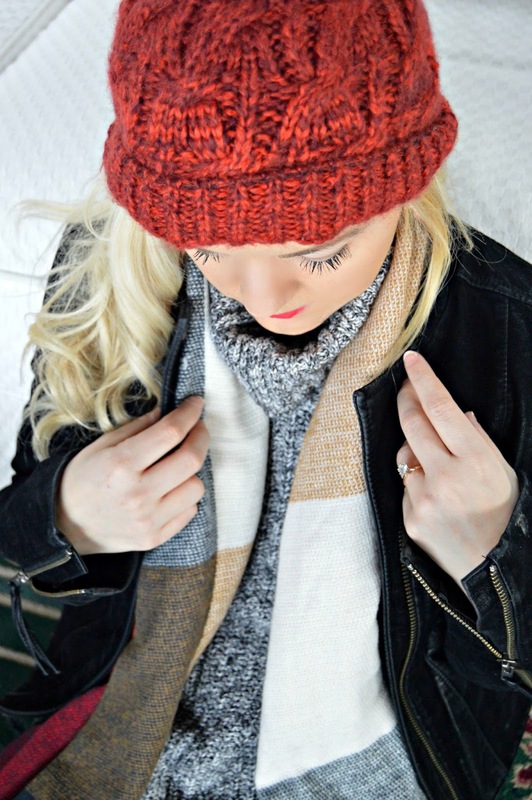 I love color coordinating my scarf & beanie as I did in my #ootd above. What are your fave winter staples!? Leave me a comment below and let me know! Or, find me over on Instagram HERE and tag me in your winter outfits! As always, I appreciate you taking time out of your busy day to read my blog. Love y'all!!! 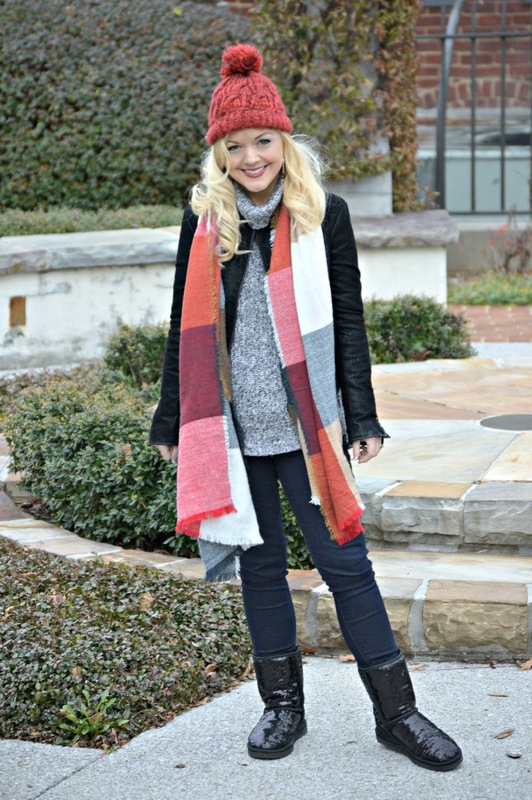 (PS: Check out this link-up here to see other bloggers who have some awesome style!). Hi Ashley, I am Ada. Nice I found your blog. I have that same scarf. Love how you styled this look. I. 'd love for you to stop by my blog as well. Would love for you to linkup with me this week. A brand-new linkup just went live. =) Thanks, Ada.